The National finals rodeo is always an opportunity to have a great time with people of all walks of life who converge at the venue. There is always something for everyone and everyone should be thinking about going. If you are still undecided, here are reasons why you should go and hopefully if not all the reasons, then at least one of them will appeal to you. The venue for the national finals rodeo is Las Vegas and this magic city should appeal to you even if you are not much of a fan of the rodeo. There is so much to do once you are in Las Vegas, so much entertainment, so much adventure. You would have a fun time down there especially at a time when there is an event as big as the final rodeo. The finals always attract the best rodeo acts, if you are a fan of rodeo then this is the best entertainment you can have, with all the best riders, and roping teams taking part and competing to be crowned winner. It is like the football world cup or Olympics of rodeo and you can experience it live at the event. Many livestock owners use this event to show off their best livestock. This is the place you can see the biggest bull in America or the healthiest cows. The livestock shows and a big attraction with many prized animals being shown off and a few competitions for students. If you like horses, then you will love the national finals rodeo, it is an event full of horses all over the place looking beautiful and majestic. If you are lucky you may even get to ride one or find someone selling a horse and if you want to, you can buy one. There is a lot of fun you can have with horses. The rodeo has been a long standing tradition in America and being able to take part or just attend this event makes you part of a long-standing tradition and is a way for you to show your pride in American culture. As the national anthem is played, you can feel the sense of patriotism filling the atmosphere with people standing up and their hats off. The national final rodeo like most sporting events reminds Americans of the rich culture and tradition that they all share. No rodeo event is complete without great barbecues and an assortment of foods. Here is a huge feast you can eat till you drop. If food is what you love, then you will really love the rodeo final. It is a chance to taste different meat cuisines at really good prices, sometimes you could even get it free. 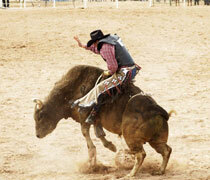 The rodeo is fun for the entire family, the children can enjoy different rides and slides at the fairs and carnivore. The activities at the fairs are numerous and even adults can have fun on the different rides and even more food is available, especially happy food like ice cream, cotton candy, and hotdogs. There are competitions as well where you can win prizes like teddy bears and cowboy hats and much more. If you love to dress up like a cowboy, love to look at cowboys or just want to enjoy the cowboy atmosphere, then the national final rodeo is just the place for that. We all at some point wanted to or still want to be like the cowboys in the movies and this is the perfect place and probably as close to that we can get. The dressing, the atmosphere, the food and the music is all that you need to feel like a cowboy or cowgirl and actually meet cowboys and cowgirls and hear them talk. The rodeo is like one big party. You can find a lot of live performances by both popular and small-town musicians with a diverse genre of music. Of course country music will rule but that is not all you can find. There are also some real parties you can attend in the different night spots in Las Vegas. You cannot fail to find a great party when you are in Las Vegas and it gets even better when it is the national final rodeo. If you like to network with people from all corners of the country and the world, this is one of the best opportunities. The atmosphere at the rodeo is very friendly so it is much easier to make friends as well as to make connections that you can use later on in your business or job. You will socialize and learn a lot as well about different kinds of people. If you like road trips and you live outside of Las Vegas, then the national rodeo is the perfect excuse for a road trip. You can get the whole family into that minivan or all your buddies and head down to the rodeo where you will have a lot of fun. It can be a chance to bond with family or friends or for you to enjoy an open road trip in your new car. There a lot of opportunities that a road trip presents. Maybe what you enjoy is not mentioned but you can trust that the NFR is an event with all kinds of activities and it is guaranteed that you will find something you will enjoy at the event so just go right ahead and go for it.